There are those that do, and there are those that don’t. Either way, most people feel strongly about camping. I used to be very much in the don’t camp, but have found myself slowly migrating to the other side — and into a tent. The thing you deal with — achy backs, missing tent parts, rabid mosquitoes and the lack of facilities — are unglamorous, to say the least. So what, then, is the allure of camping? Freedom: Just pick up a tent and go. You can be impulsive and go on road trips on a whim, with no need for advance planning or itinerary-making. It’s the ultimate feeling of freedom, something we rarely ever get to experience in modern society. Kids also love it because it is suddenly acceptable for them to behave like, well, kids. And they may just get to see their parents do the same. 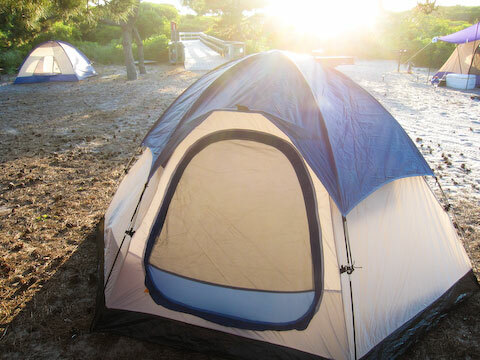 Just you, the tent and mother nature — freedom and tranquility. 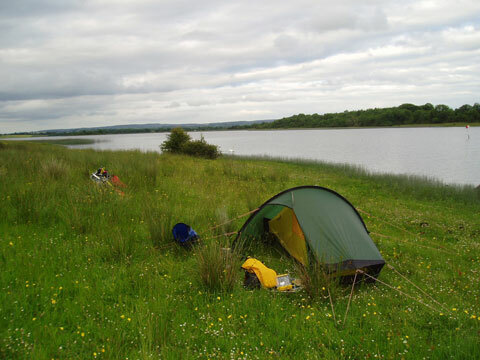 Here, a camp on Trannish Island, Upper Lough Erne, Northern Ireland. Photo by Steve Cadman, Creative Commons. Advertising photograph of two men, with their 1972 International Scouts, setting up camp in a wooded area. Photo by Wisconsin Historical Images, Creative Commons. A change of pace: Constantly surrounded by different forms of media and entertainment, we forget how important it is to entertain ourselves. Unavoidably, when we hit the “on” button on anything, we turn off. Unless you bring a generator (and please don’t), there is no access to TV, video games or extensive music libraries and you are left to your own devices. What you can do instead is read, tell stories around the campfire, play board or card games and perhaps instruments. What sounds like it would make for a more relaxing weekend? 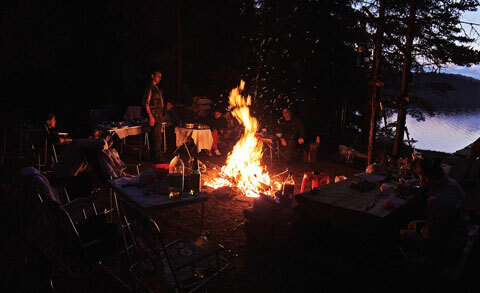 Storytelling around the campfire, one of the basic tenets of camping. Photo by Boby Dimitrov, Creative Commons. Primal Instinct: Far removed from all the conveniences of modern life, you realize just how hard it was to simply survive back in those frontier days. Cooking alone can consume the better hours on an entire day, but it’s so much more fun when done over open flames! Camping also kind of makes you want to go home and watch Survivor Man to learn more about how you could actually survive in the wild, should you ever have to. Wild animals and strange sounds are not unusual when night falls, so fear it or embrace it. Bears don’t like to eat humans, they just want our food. A weekend of camping will surely put you more in touch with your primal instincts, though. 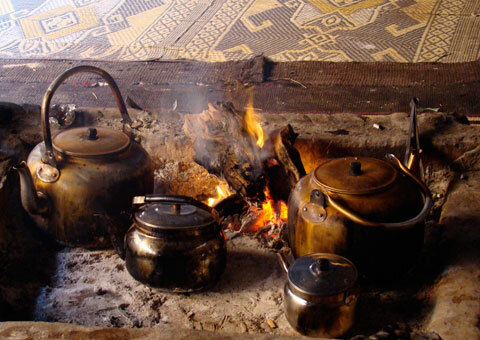 Cooking over a Bedouin campfire in Wadi Rum, Jordan. Photo by Susanne Koch, Creative Commons. 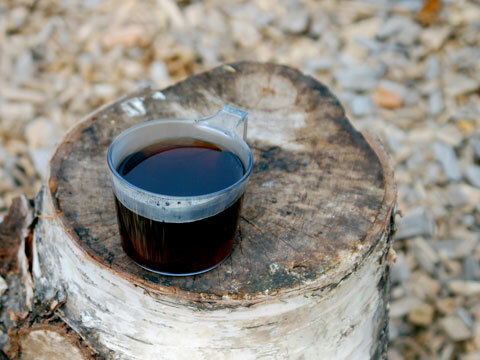 What could be better in the morning than hot campfire coffee? Photo by smcgee, Creative Commons. Empowerment: Without a kitchen full of tools, campers will have to learn how to manage. This is very good for creativity. I can’t think of how many times I have stood somewhere far from the city, with a wine bottle in hand, just realizing that I forgot to bring a bottle opener. But every time, the cork has somehow come out of the bottle — when there is a will, there is a way. We all have a little MacGyver inside, just waiting to get out. Even a normally simple act, like opening a can, will seem like an amazing feat when it’s done with a sharp twig. A weekend in a tent will make anyone reflect on all those gadgets we all have and whether we really need them. I do love my human-powered LED camping light by Freeplay, though, and would strongly recommend any camper to get one. Only your imagination limits where you go. 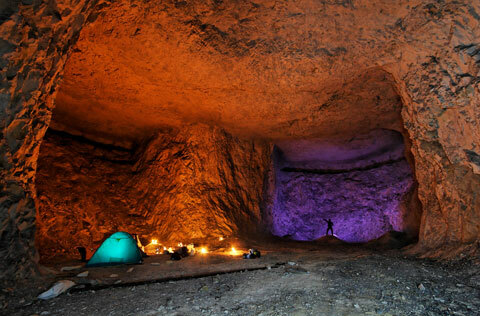 Here, a camp set up in a marble quarry in Les Îles, Rhone-Alpes. Photo by Hugo Clément, Creative Commons. 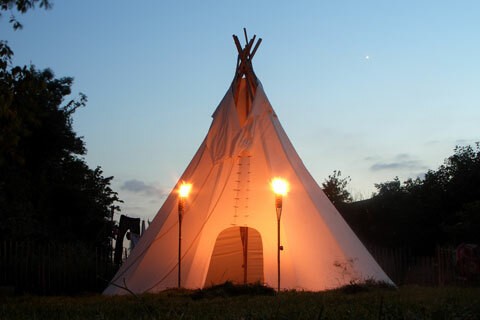 Do it Your Way: If camping in a small tent is simply not chic enough for you, maybe you’d want to try the luxe version, “glamping” — sleeping in the outdoors in a teepee (put up by someone other than yourself, naturally), possibly filled with Mexican blankets and (faux) fur throws. 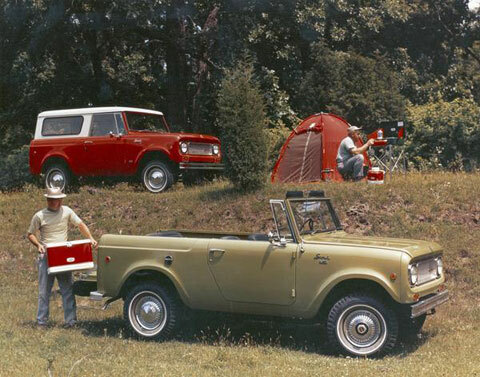 You could also call this “statement camping” because it’s clearly about style more so than simplicity. But, “glamping” is also proof that everyone could camp! Vogue Italia recently did a whole fashion story based on camping chic. Just remember to bring a bottle of Veuve. 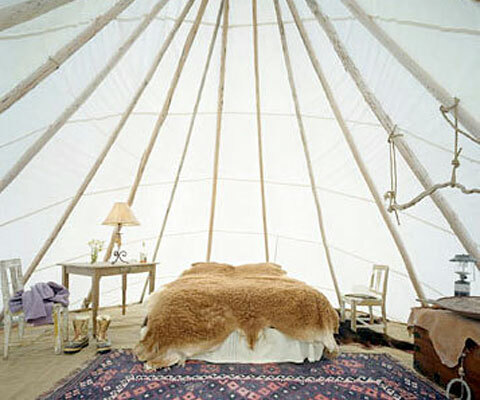 If small tents are not your thing, try “glamping” in a luxe teepee! Photo by jamesmorton, Creative Commons. Maybe you go for something slightly more fab than a sleeping bag? Photo by ooh_food, Creative Commons. My parents did not camp, so I did not grow up with an appreciation for this type of vacationing. The first time I slept in a tent was in my backyard. My neighbor (whose parents were avid campers) and I had planned for it a whole day in advance (basically forever when you’re seven). We put the tent up, with a bit of help from adults, and crawled into our sleeping bags as it started getting dark. We lasted only a few hours before going back inside the house to sleep in our beds. I did not camp again for twenty years. The great thing is, though, that you don’t really have to have any kind of experience! Just buy or borrow a tent and get out in nature. See what happens! My very own camp, set up on Fire Island earlier this summer. 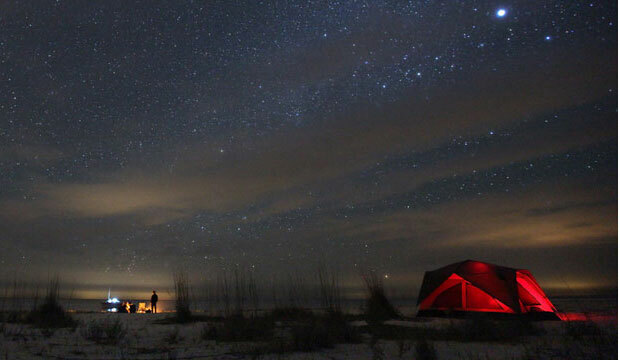 Top photo: Camping on Middle Cape Sable Beach on the southern most tip of the continental U.S. By Nate Bolt, Creative Commons. but i do have to say one more! the number one reason to go camping in my opinion is.. STARS! lying beneath a blanket of stars, seeing the moon & the night sky always reconnect me more deeply to the magic and wonder of the world!